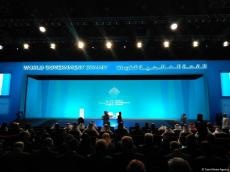 The seventh session of the World Government Summit kicked off on Sunday in Dubai, United Arab Emirates (UAE), with the participation of more than 4,000 people from 140 countries, Trend reports citing Xinhua. "Human being is the centre of the World Government Summit. Our main aim is to foresee the future of different sectors to improve humanity," Sheikh Mohammed bin Rashid Al Maktoum, UAE prime minister and ruler of Dubai, said. He added that "the summit will unite efforts and ideas to reinforce people's wellbeing." At the opening address, Schwab called for "Globalization 4.0" to address the rapidly complicating landscape presented by the fourth industrial revolution. Referring to the post-cold war period of global growth, Schwab said that it had lifted hundreds of millions out of poverty but "left winners and losers." Additionally, 20 reports with latest figures, studies and data will be published during the summit to help decision-makers and officials to formulate future strategies.